Put the brakes on. Get out of the fast lane. Slow down. Whatever motoring analogy you pick, the assumption so far has been that Volkswagen would deal with the biggest crisis in its history by taking its ambitions down a notch. But contrary to expectations, VW's new leadership says the company is instead putting its foot down. One analysis of the root cause of Volkswagen's emissions-rigging scandal is that the company just got too big, too ambitious and too greedy. VW was so determined to beat Toyota at all costs, goes the theory, that it was willing to cut corners. In a bid to crack the US market, pressure was reportedly piled on employees to achieve the holy grail of a diesel car which was low on both toxic emissions and fuel consumption - all the while staying unfeasibly powerful. VW's global ambition was called Strategy 2018. Announced eight years ago, the aim was to sell more than 10 million vehicles annually, and replace Japan's Toyota as the world's biggest-selling car manufacturer. That goal was reached earlier this year. That suddenly looked like a hollow victory four weeks ago, when VW admitted that diesel cars had been fitted with software to cheat emissions tests. The company now stands to lose billions of euros in fines, repair costs and litigation, not to mention a plummeting share value and potential loss of future sales. Along with the well-justified outrage from consumers and politicians, there has also been a fair amount of schadenfreude from competitors and critics abroad, ready to see cocky VW cut down to size. But on Thursday, VW's new chief executive Matthias Mueller bullishly made clear, that's exactly what is not going to happen. "Our competitors are waiting for us to fall behind technologically, because we are spending all our time focusing on ourselves. But we aren't going to do them that favour," Mr Mueller said. What this means in practice is a billion euros (£735m; $1.1bn) in spending cuts annually on the one hand, and more innovation, particularly in electric cars, on the other. Plus a completely new corporate culture which allows more creativity and questioning rather than autocratic top-down decision-making. Budget cuts on their own won't save the company is the message: that way lies brand mediocrity. Whether this approach is a sign of overweening pride or impressive leadership depends on the outcome of the investigation into the emissions cheating scandal. Many have welcomed the appointments of Matthias Mueller as chief executive and Hans Dieter Poetsch as board chairman. Both are experienced, knowledgeable and respected. But they are also loyal VW insiders. And their future credibility rests on the investigation finding them innocent of involvement in the emissions rigging. The other problem is that the company has barely started the process of winning back the trust of the owners of those cars affected. Recalling and fixing vehicles could take until the end of 2016. And there are complaints that VW has been too slow revealing information about which cars were tampered with and how they will be fixed. And on Thursday, German authorities announced that the recall of millions of vehicles would be compulsory, rather than voluntary. An unusual step which is being interpreted as a lack of trust among political leaders of VW's handling of the crisis. Despite all this though, there are signs that faith in the brand itself has not been destroyed. 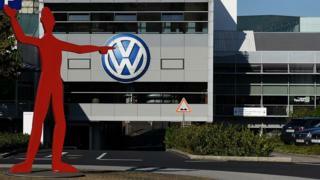 Sales in VW in the European Union went up by 8.4% in September. And earlier this week, VW's share price started to recover. Possibly an indicator that in the eyes of some consumers, fiddling lab tests does not undermine VW's ability to build cars. Will the company be brought down by this crisis, simply survive it or emerge even stronger? For many in Germany, that depends on whether the new leadership's confident approach is admirably ambitious or dangerously delusional. 1937: The company is set up by the Nazi trade union organisation, the Deutsche Arbeitsfront, which aimed to create a "people's car". 1938: A factory is built in the new town of KdF-Stadt, now modern-day Wolfsburg. 1945-49: The heavily bombed factory comes under British military control towards the end of WW2. The British retain control of the company until 1949, when it returns to German hands and becomes an important element of post-war West German regeneration. 1973: With sales of Beetles declining, VW switches to a new generation of cars with front-wheel drive and water-cooled engines - the Passat, Scirocco, Golf, and Polo. 1998: Having already acquired Spanish carmaker Seat and Czech brand Skoda, VW embarks on a round of acquisitions of famous names, buying up Britain's luxury car maker Bentley, France's Bugatti and Italy's sports car maker Lamborghini. 2012: Years of wrangling between Volkswagen and Porsche comes to an end when VW buys the remaining half of Porsche's car-making operations. 2015: Overtakes Toyota to become the world's biggest-selling vehicle maker, but admits rigging emissions tests months later.